How do you make dentures look natural? Our team will advise you on all the elements available in your new teeth selection. Color, texture, shape, and gum material are just some of the facets of what determine what looks natural or not. What options are there? Tooth shape and color? Gum line? Gum materials? Mold sizes? There are many options that go into crafting your new smile. These depend on whether or not the dentures are removable or not and how many teeth are affected. Single tooth replacement Conventional bridges or implant retained crowns are used to replace single teeth. Conventional bridges require that the surrounding teeth, upon which the bridge rests, be drilled down. This increases the wear and pressure placed on those teeth. If the supporting teeth develop cavities or periodontal disease, the conventional bridge may need to be replaced by an implant retained crown. Implant retained crowns are a surgical intervention. A crown is attached to an implanted post. This implant then replaces the support of the lost tooth. Implant bridges are an expansion on implant retained crowns. A single post implant supports a bridge of replaced teeth. Again, this is a surgical intervention that require posts to be implanted into the jaw bone. Removable partial dentures involve denture teeth, acryclic gum replacement, and a metal framework. This approach doesn’t require any adjacent teeth be drilled. It uses the metal arms and framework to hold the denture teeth in place. Conventional fixed partial dentures are similar to bridges in that they require adjacent teeth to be drilled down to support the partial. While this option lacks the appearance of metal in the mouth, it does increase the stress placed on the supporting teeth. There are similar options for full mouth replacements. The decision on the best option needs to be made through the current and long term bone health. Whenever a tooth is extracted, if there is no structure set inside the jawbone to replace it, the bone will begin to disappear. So when all the teeth are extracted, it’s very important that something be done to preserve and encourage bone health. 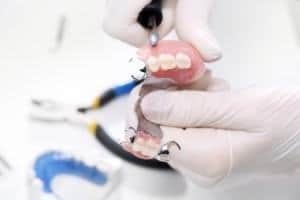 Conventional removable dentures are prosthetics that sit on top of healed tissue once all the teeth have been removed. They use temporary adhesive to stick to the upper and lower jaw and mouth tissue. Implant alternatives to conventional dentures are: implant assisted fixed bridges and implant assisted overdentures. Both of these options require posts to be surgically placed into the jawbone. Implant assisted fixed bridges use strategically placed posts to support full lower and upper jaw prosthetic teeth. Implant overdentures usually require less posts than fixed bridges. The prosthetic includes acrylic tissue below the teeth, giving them a very natural look and comfortable feel. How should I expect my dentures to fit? This depends on which of the above options you have selected. Also, we encourage our patients to clearly communicate any discomfort they feel while wearing their dentures. Recognize that after tooth extraction your jaw and gums heal and change, and therefore the way your dentures fit will need to be adjusted. Does the fit change after time? Periodic checking of all the above denture products is necessary. The jaw and mouth change with time and use, so it’s important to attend all regular checkups and call your dentist if you’re experiencing discomfort or pain. What can I do to improve the fit? The best thing you can do is to follow your doctors instructions and communicate clearly. From the doctor’s perspective things can look perfect, but it you’re experiencing discomfort, it’s important that you let her/him know as soon as possible. How can you give customized looks to the teeth? Can you blend molds for me? Each of the teeth replacement solutions above offer many types of options for both aesthetics and comfort. Discuss these with your doctor. This is something that your doctor will discuss with you. It’s important to understand though that once a tooth, a single tooth or all teeth, are removed, the bone will begin to shrink. Your doctor will assess your current bone structure and advise on the best treatment to retain as much healthy tissue as possible. How long is the process from the initial appointment through when the work is completed? This depends on your current oral health and circumstances, the solution you and your doctor choose, and then your body’s healing time. Following your doctor’s instructions will help you heal smoothly and quickly.